What first attracted me to FIFTYTWO’s new puzzle game, Kenshō, were the gorgeous animations and lovey music in the App Store trailer video. I’m happy to say that that the game delivers every bit on both accounts. But what’s hard to tell from that video is what that gameplay would be like, and that’s unfortunately where the game falters a bit. 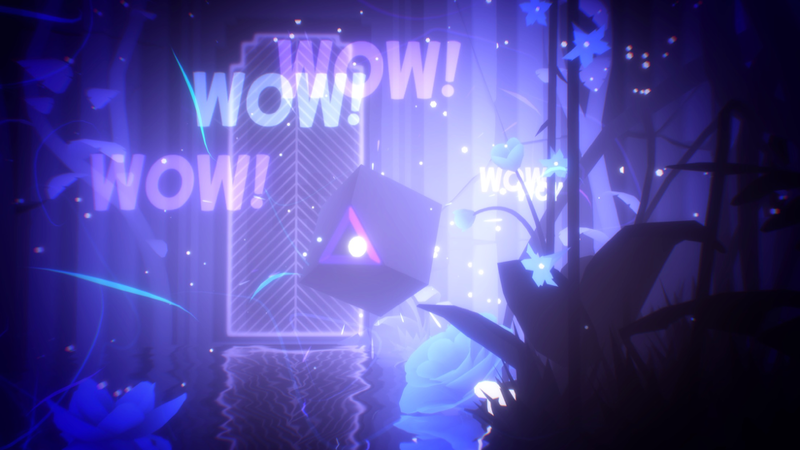 In Kenshō, you’re following the story of a robotic cube as he travels around, meeting other creatures like a deer or hummingbird. He doesn’t speak, but he does have emoji explosions that help express his mood. Along the way, there are some lines of text that try to explain the story, though it is still very much up to interpretation. The robot is cute, considering he’s just a cube with a triangular eye socket, and even if they are a bit abstract, those story bits help pull the game along. It also ties into the puzzles, as the story is broken up into eleven levels, each separated by a door. 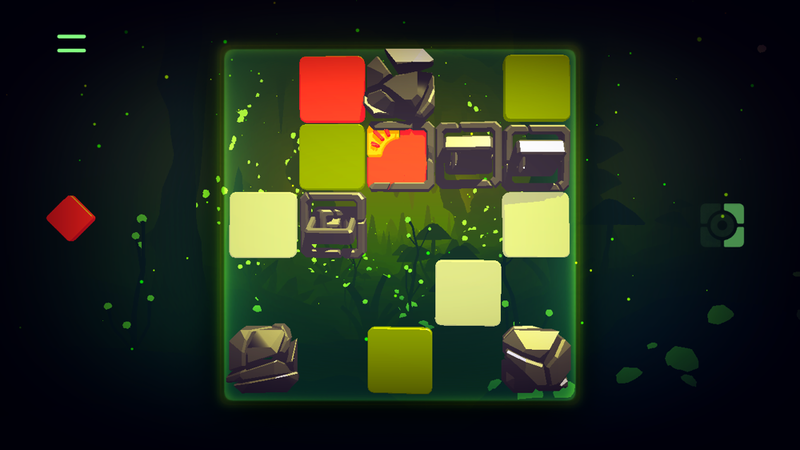 They have names like “In the Woods” and “Mysterious Cave” to represent where the cube is traveling to, but also to offer variety in the puzzles’ backdrops. Like I said, the bright and colorful animations are just pure eye candy. It’s hard to even do them justice with words, so I recommend watching the video below. But with each new door you open, the cube will be flooded with explosions of light and color. While the highest graphics settings did do a number on my device’s battery (I recommend lowering them), I was amazed that they never lagged on my iPhone 6S, despite it being somewhat outdated by now. And to accompany the breathtaking visuals is a super chill soundtrack featuring eleven different songs. I can honestly say there wasn’t a moment where I wasn’t enjoying the music. It’s rare for a game to be able to hold my attention with it’s soundtrack from beginning to end. It’s clear that a lot of love went into this game. There’s even iCloud sync and the game can be played in either portrait or landscape mode, making it perfect as a one-handed game or for your iPad on your lap. Even the puzzles are interesting, consisting of a mashup between the Threes! swiping mechanic and a match-three. You basically swipe up, down, left or right and all the tiles on the board will slide over once in that direction, with the new tile appearing somewhere alongside the edge of the side you swiped from. When you match three in a row of the same color, they disappear form the board so you have more room to breathe. 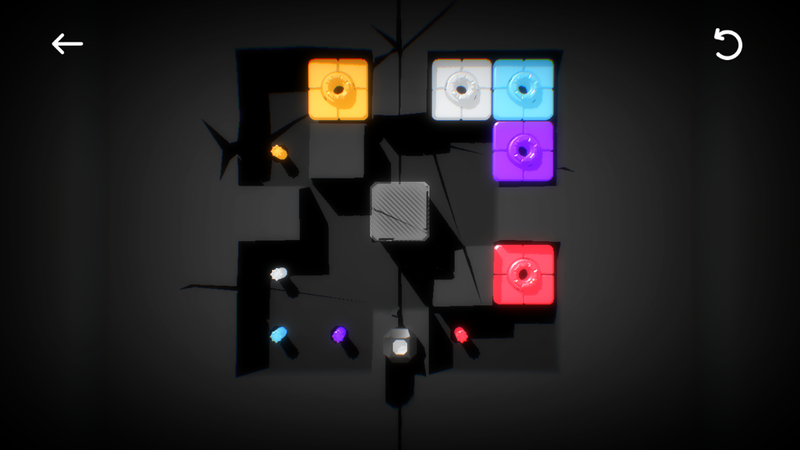 The goal in each level is to collect keys, which are each broken up into five parts. One section will be on the board at a time, welded to one of the colored tiles. It stays on the board until you clear that tile, at which point a new key piece will appear. 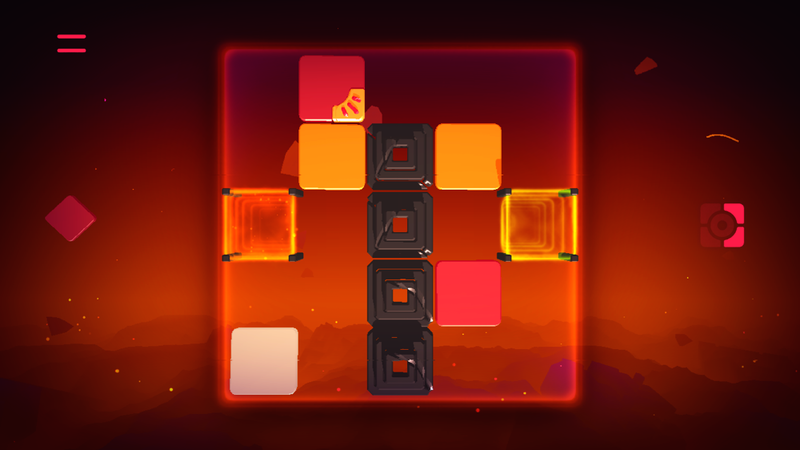 Each level introduces a new type of tile, such as those that can only slide up and down, those that are stuck in place, or those with walls that can only be cleared if they’re inside a force field. These new mechanics keep the game interesting from beginning to end. Once you’ve collected all the keys of a level, you have another puzzle to solve involving all of those keys. You need to swipe to move the colored keys to their matching pegs. Once all five keys are in place, the door will unlock. I actually liked these puzzles quite a bit, and was disappointed there were so few of them. I wouldn’t mind seeing more of them in the game’s second chapter, which is advertised as “coming soon.” Since the rest of the game is more randomized, it was nice to play some hand-crafted puzzles that required some planning ahead and without any crutch if you mess up. Here’s what I mean about that crutch. There’s one major problem with Kenshō. As a toy, it’s great, but it’s lacking as a game. There’s no real challenge with the core puzzles. If you fail by letting the board fill up completely with tiles, you’re not really punished in any way. The board clears out and instead of setting you back to just after you cleared the last key, it instead resets the board to a much easier state, without penalizing you in any way. You still keep all the keys and key parts you already collected. Upon completing the story mode, you can play endlessly, but there doesn’t appear to be any sort of score system, so I’m not sure what the motivation is supposed to be. Is it just a toy? This is such a bizarre design for a puzzle game. I wish the game gave me more of a reason to continue playing so I can enjoy more of that artwork and music that I love so much. The endless mode already has the basis for a high score chaser, but it wasted the potential. Something as simple as a leaderboard with the number of keys you construct before failing would give it replay value. Perhaps it’s not the most interesting way to implement the high score aspect, but if the developers didn’t want to figure out a more complex scoring system, that would have been something, which is better than nothing. In any case, I’m still glad I played the game. It’s a very chill, zen experience. But for those — like me — hoping for more of a challenge, you might be disappointed. If you want to give it a try and enjoy the relaxing art and soundtrack, you can download Kenshō here.